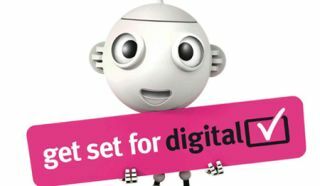 Digital switchover is complete | What Hi-Fi? Today marks the completion of the UK's switchover to digital television, with the last analogue transmissions – in Northern Ireland – being switched off at 23.30 tonight. It ends more than 70 years of analogue TV broadcasts and means everyone in the UK should now have access to digital terrestrial TV, be it Freesat of Freeview. The change will also see the end of Ceefax, after three decades of the text news service. Viewers who need information on how to update their TV equipment in order to access digital channels should call Digital UK on 08456 50 50 50. The spectrum freed up by digital TV switchover will be auctioned off at the end of this year to provide new 4G mobile networks. 90 years of analogue TV history – and how our Buying Guide played its part!